Tell us your story and we’ll publish it on our blog. Okay! What should I write on? 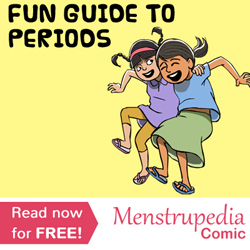 If you have something that doesn’t fit the mold but has been a result of your experience on Menstrupedia’s website or social media pages, feel free to pen down your thoughts and send them to us. Cool. So I just need to send the article then? Not quite. At Menstrupedia, we believe in celebrating our writers for speaking up on a conventionally taboo topic. It’s your time to shine! Along with your article, please send us the following details. 2. Link to your blog, webpage or online presence – because it’s time you got more likes and followers! 3. A lovely picture to go with it. Awesome! So what are you going to do once I send you the article? We will work on a relevant artwork to go with your article (because we love drawing! ), give your article due credits and circulate it on-line in our network so that your idea reaches out to more number of people. You are, of course, free to link the article to your personal blog/webpage. Wow. This is great. Anything else?